The 8 Best Trends of CES 2014! Learn all about the Top Trends at CES 2014, the global consumer electronics and technology tradeshow where next-generation innovations are introduced to the marketplace. Check it out Now! 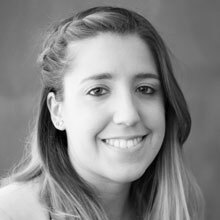 Luciana is Marketing & Sales Assistant at Making Sense. She has a PR degree and she describes herself as a Social Media addict, fashion and iPhone lover. Contact her on Twitter! Last week everyone was talking about CES (Consumer Electronics Show), the global consumer electronics and consumer technology tradeshow that takes place every January in Las Vegas, Nevada. Our CEO Cesar DOnofrio had the amazing opportunity to attend and share with us the top trends of this global stage where next-generation innovations are introduced to the marketplace. It was really tough to choose the best of CES. This year we had tons of new and trendy products including wearable, cutting-edge display technology, 3D printers, robotic toys, and smart cars, and all of them were incredible innovative. In order to keep you informed with the latest technologies, here we selected the 8 top innovative trends from CES 2014! One of the main topics at CES this year was the “Internet of Things”. This concept describes new technologies that will put even the most insignificant object on the Internet, that means all of our devices are starting to talk to one another. It can be applied to a TV, toaster or anything you stick a sensor to and monitored from a tablet or smartphone. Cisco, the world’s biggest maker of networking equipment, made a big push this year at the show. Its CEO, John Chambers, shared his vision of The Internet of Everything, saying he believed it would become a $14.4 trillion market by 2022. Cisco also went prepared with a handful of new IoE-based solutions and services. There were hundreds of connected products at CES with small sensors and wireless connectivity, allowing them to work with other products in your life. Another thing that was a Trend Topic during CES 2014 was the world of health tech. The technology industry is putting some serious brain power behind the next generation of wearable health devices. This industry has exploded with a huge line of fitness trackers, heart rate monitors and other exercise tools. The world of health technology is growing really fast, particularly as more tech-savvy consumers age and face chronic ailments such as diabetes or high blood pressure. Withings, showed off its newest health monitoring device, the Aura Smart Sleep System, a bedside device with an ambient light, a sleep sensor, and an app, designed to monitor and improve the sleeping experience. We also had the Digital health company MD Revolution, Inc., which launched RevUp! Health Accelerated, a new digital health solution that will allow consumers to track health metrics, nutrition data and various fitness parameters using their mobile device or computer. Consumer Electronic Show was full of wearable objects! These devices cover a huge range of prices and applications but they all have many things in common: they are connected, they’re small, and they’re worn on the human body. The Wearable Tech category is dominated by fitness gadgets, but also containing smart watches, sports gear, reality glasses, and other items with wildly varied feature sets and purposes. Wearable tech is also linked with digital health, for example it is ideal for monitoring your personal wellness and achieving fitness goals. 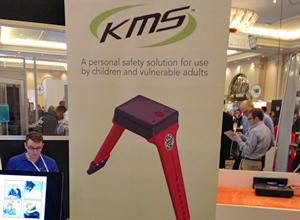 One of the most innovative wearable device was created by KMS, a wristband that tracks your child’s every move via GPS. It also works like a panic button that when pressed dials a series of pre-programmed phone numbers until it gets an answer from a human. Another great example of innovation, technology and design was Pebble. This company launched their new smartwatch, Pebble Steel, with a whole new brushed aluminum shell and wristband what makes it look and feel like a luxury timepiece. There’s no doubt this year CES was totally wearables-friendly. All kind of TVs were shown during this year’s show, from curved to 4K, bendable to backlit. So, what are Ultra HD or 4K? They are the same thing: HD resolutions are four times higher than a broadcast in 1080p, that means video content will look sharper than the current generation of high-definition sets. As with any new type of television technology, 4K won’t be found in the average home for a while, but it’s the latest and greatest TV screen to strive for. These new televisions will support external hard drives. They have much better audio, and some will have professional calibration tools built right in. Technology in the home had a significant presence at CES 2014. This year’s show was focus on home automation related to security. It was amazing to see so many devices that will make our life at home so much easier and safer. The variety was huge, from a high-end luxury oven that’ll save you time in the kitchen, to a smart lock from Goji that adds to your home’s security, Skype-connected baby monitors, smart lighting systems, and a Bluetooth enabled meat thermometer, all of them controlled via mobiles and computers. The digital home is turning out to be more about home sensing, control, and automation. The Robot Revolution is here! They were a big hit at the show again. Products like the Orbotix Sphero 2B, the Ozobot, and Anki Drive show let you control and play with robotic gadgets wirelessly and even control them from your smartphone or tablet. Parrot also expanded its family of robots with two new drones on the market. One is the MiniDrone, a smaller version of the popular AR. Drone 2.0, and the other is kind of a secret project: the Jumping Sumo, a tiny two-wheeled robot that can jump about three feet high. 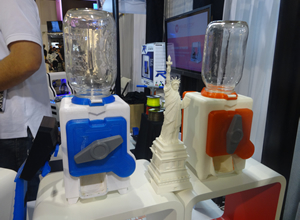 More than 30 companies showcased their 3D printing technology and it was nice seeing them all lumped together on the show floor. The best thing is that this year the price of some 3D printer, got lower, such as the Da Vinci 3D printer by XYZ printing for $499. We also had MarkerBot’s new Replicator Mini was pitched as an affordable desktop unit for beginners. It prints at a 200-micron resolution, while the larger units can print at 100-micron resolution. The printers can use biodegradable PLA filament, which serves as a greener, more sustainable alternative. We will soon be able to produce toys, belts, cups, spare parts, and other plastic items at home as easily as printing a document. For car lovers CES 2014 was the perfect place to be! Thousands of square feet of the show was devoted to autos, showcasing tech that brings the web to the dashboard. Some of the companies took over much of the gadget expo to offer previews of vehicles connected to smartphones and mobile computing tech. For example, Audi included two self-driving cars, one of them with laser lights. Ford showed its C-MAX Solar Energi Concept car, which has a 16 square feet solar plug-in hybrid crossover. People also had the chance to see Toyota’s i-Road three-wheel car, which has a closed body similar to a car, but there are some items that bring comparison to a motorcycle. Making Sense can’t wait to be there next year representing Argentina in this amazing and innovative event to take in all the inspiration, creativity and professional growth this show has to offer. If you would like to learn more about how our company can help you develop a suitable and innovative software for these kind of devices at a reasonable price, with a great UX and unlimited scalability, please contact us at hello@makingsense.com or fill out this form. You ♥ this article? Once a week we write a new one. Take a look at our recommended post! Ready to discover the Gaming Trends for 2014? Find out why this year is going to be marked by the deployment of new home consoles from some of the biggest players out there. Learn more now! 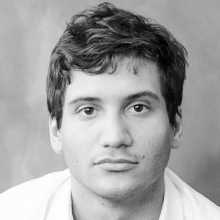 Leandro is a highly experienced Systems Engineer with a passion for Video Games and VR. He has worked on Web Development, Backend Services, Mobile Apps and Video Games, having learnt a great deal of languages on the way and acting as Tech Lead and mentor for the newest members of the team. In his free time Leandro enjoys working on Educational initiatives.